2 strand champagne Keshi pearl necklace, petal shape and Swarovski crystals. 18kt gold plated silver clasp. 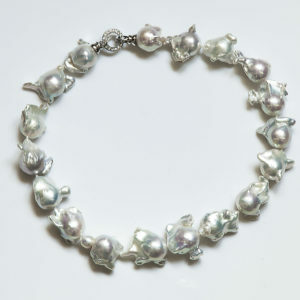 5 strand necklace with white, champagne and grey freshwater pearls. 925 silver clasp. Necklace with freshwater pearls interspersed with swarovski crystals and a 925 silver pendant with a baroque pearl and high quality Swarovski crystals. 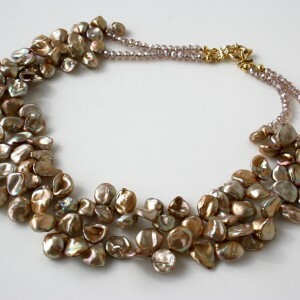 Multistrand necklace with champagne and bronze freshwaterpearls and Swarovski crystals. 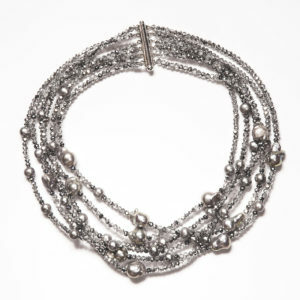 MULTISTRAND NECKLACE WITH SILVER FRESHWATERPEARLS AND SWAROVSKI CRYSTALS. 925 SILVER CLASP. 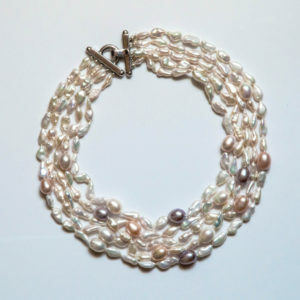 MULTISTRAND NECKLACE WITH FRESHWATER PEARLS AND HEMATITE. 18 KT GOLD PLATED SILVER CLASP.